This is a totally un-math related post. 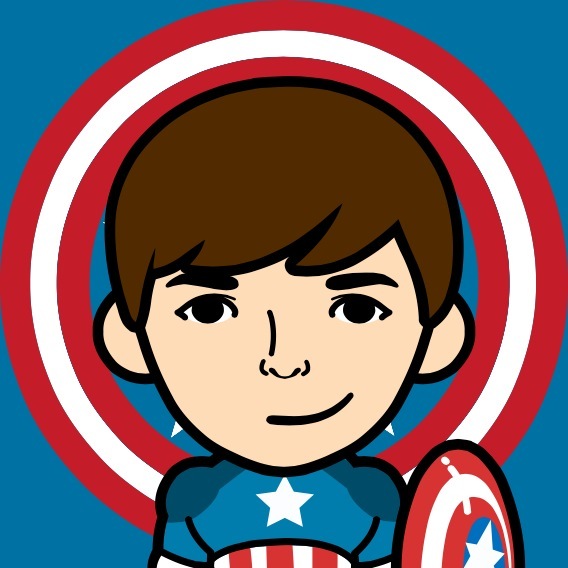 My daughter downloaded the iPhone app FaceQ not long ago. 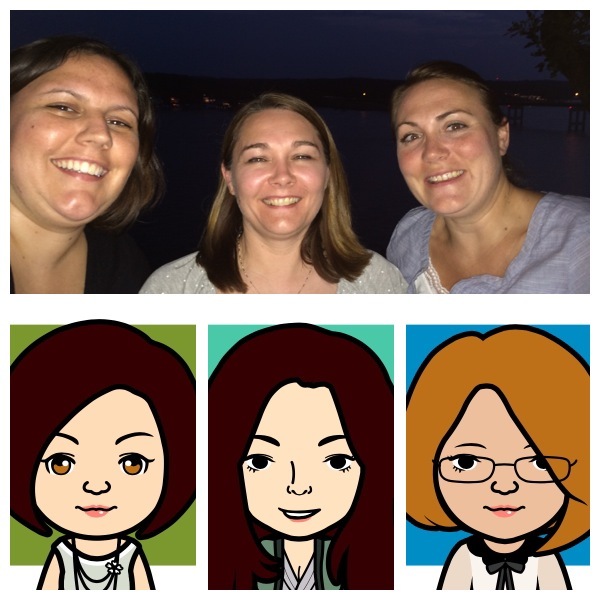 It was super fun creating avatars. I can’t say “use this in your classroom” because it does have profanity as some of the extra options. I’m still debating about using it for my students. It’s very easy to use and if anything, something for your personal use when you don’t want to upload an actual picture. Here’s one of me and my teaching buddies. I put it into a collage to display. It actually creates one image that can be shared or saved to the camera roll. This is my rendition of my 11 year old son. I feel like I always start a post, “I found this idea…” and it’s usually from one of two websites (mentioned frequently by me.) I, however, feel like this is what makes the teaching profession great. WE SHARE! Well, this lesson is no different. I found this idea 🙂 at Math=Love and adapted her idea to fit my notebook. 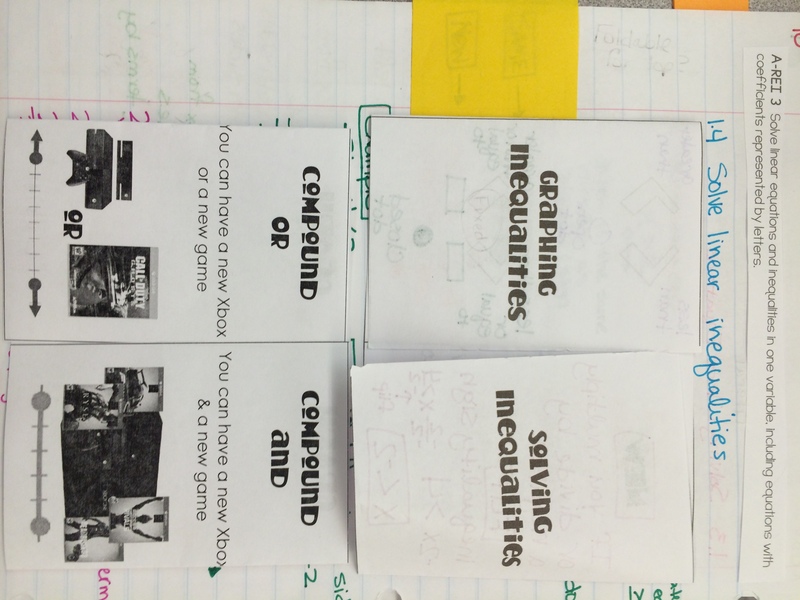 I created two foldables, one for graphing inequalities, one for graphing compound inequalities. I used XBOX and Call of Duty in my foldable because we talk about gaming a lot! I love to play video games and students love to talk about the video games they play. Please disregard the extra “crap” behind the foldable. This is one page that was definitely a work in progress. Those are original ideas behind the foldables, not all the ideas are gems either. We had examples for the students work on the next page and I walked around and helped and gave smiley faces. It’s amazing what a smiley face will do for a student. I’ve included the pdf version of all the files. The notebook looked good though 🙂 and I did have some success. It wasn’t a total failure. 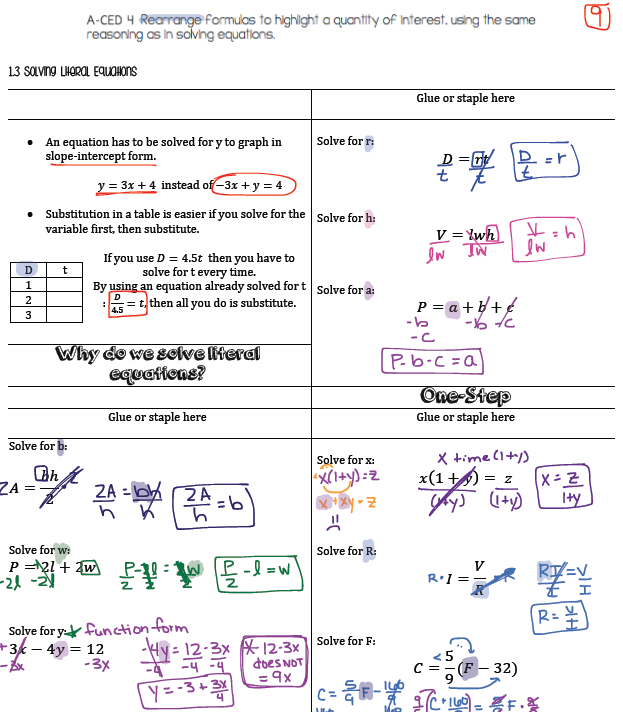 The “Why do we solve literal equations” part is something I always talk about but I think putting it in writing helps. Since students think this process is awful, they should at least know why we do it. Here are the goods, if you want them. 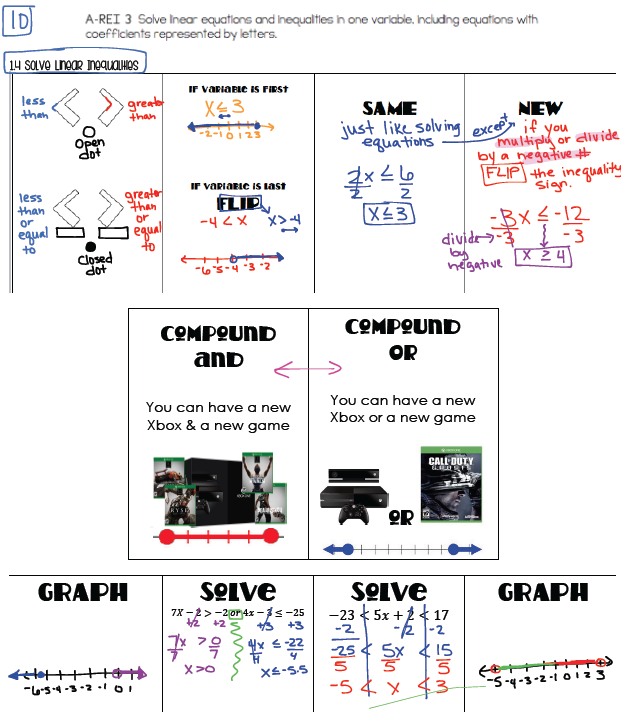 We split solving equations into two days. 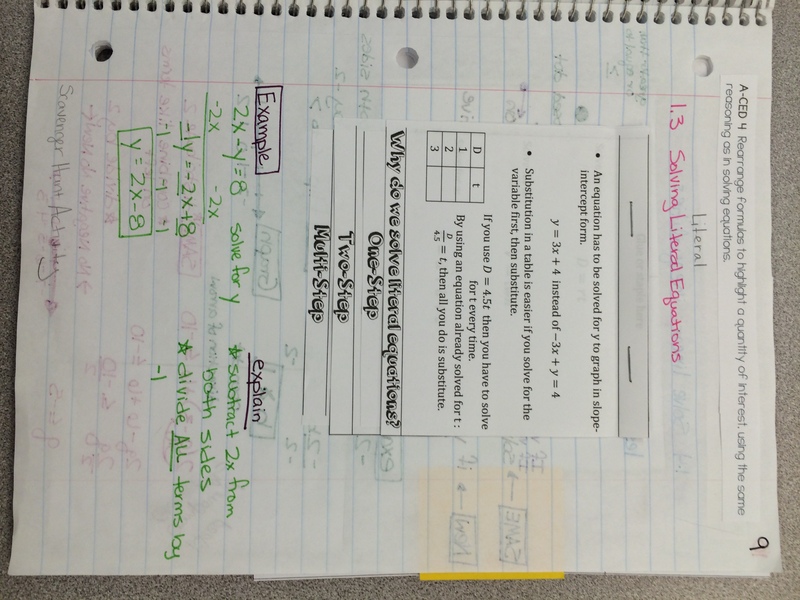 Our curriculum has solving equations as review, but our new standard adds the explain element to problem solving. I think it’s a good place to start the year. 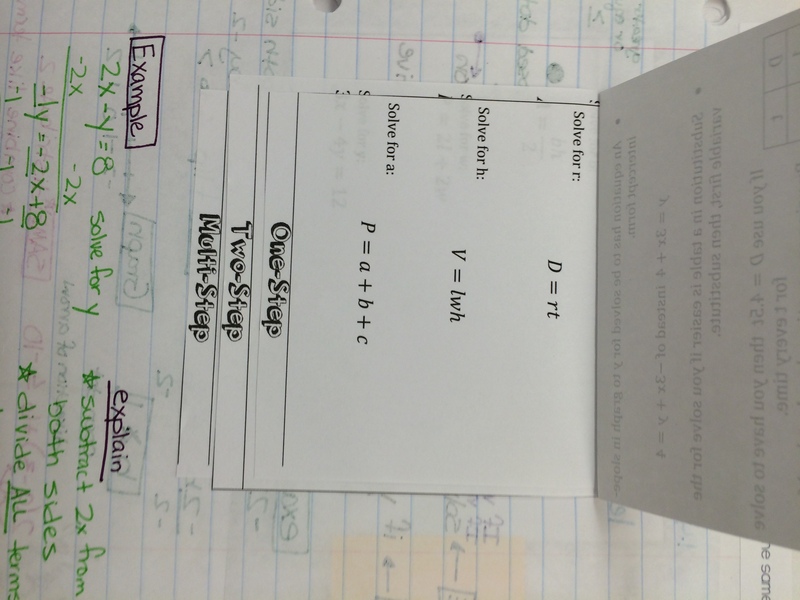 I used the rest of the foldable from Everybody is a Genius, and added a few other ideas found around the web (I can’t find the source now). I am also making files for my iPad so I can put the notes on my website for students who were absent or missed something during the process. I like how this is working out also! 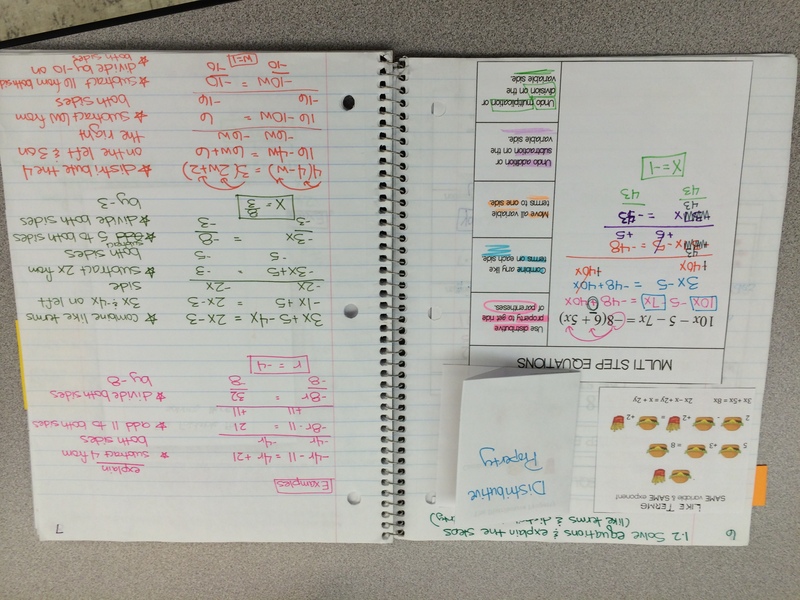 The students are getting the process figured out and we aren’t taking as long getting items glued into the notebook. We also used our data tracking sheet for the first time this week. I’m excited to have the students enter their second assessment so they can see how much they have improved. 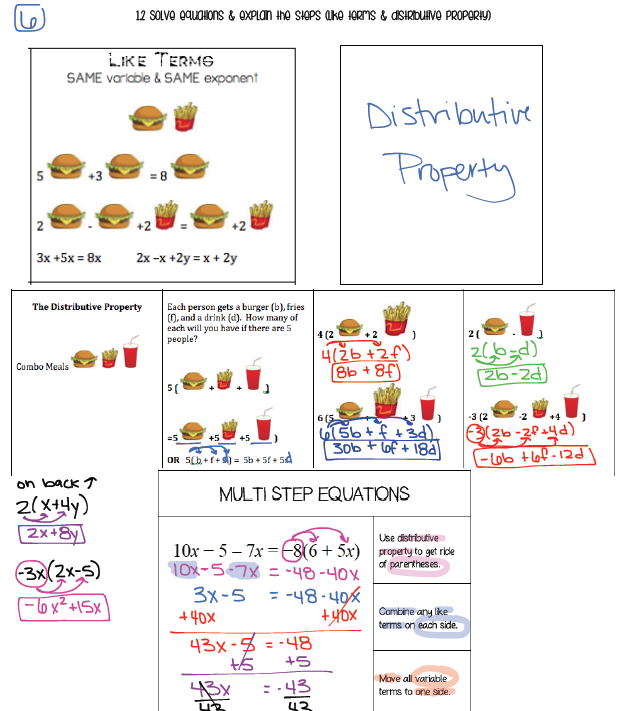 I have shared the link to my foldables (again, adapted from things I’ve seen on the web) and my pdf iPad files. Two of them are Word files but you can download the fonts for free. Just click in the font box to see what you need and head to the web for a search.